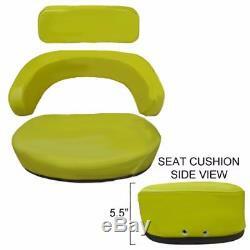 John Deere Yellow 3-Piece Deluxe Steel Cushion & Back Tractor Seat (W/O Bracket). Made to replace OEM:TY9326, Replacement Cushions for the Following John Deere Tractor Models: 600, 820, 830, 2010, 2510, 2520, 3010, 3020, 4000, 4010, 4020, 4025, 4030, 4230, 4240, 4320, 4430, 4440, 4520, 4620, 4630, 5010, 5020, 6030, 7020, 7520, 5020 John Deere Combine Models:45 (S/N to 6900), 55 (S/N to 69000), 95 (S/N 20001 up), 95H (S/N 23501 up), 96, 105 (S/N 3001 up), 3300, 5200, 5400, 6600, 6602, 7700 John Deere Cotton Picker Models: 99 (Deluxe Seat), 299, 9900, 9910 John Deere Cotton Stripper Model: 484 John Deere Forage Harvester Models: 5200, 5400 John Deere Hay Cuber Models: 400, 425 John Deere Sprayer Model: 6000 Color: Yellow. 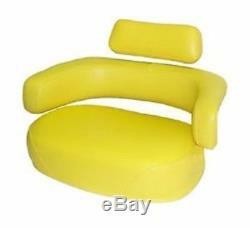 The item "John Deere Yellow 3-Piece Deluxe Steel Cushion & Back Tractor Seat (WithO Bracket)" is in sale since Monday, July 10, 2017. This item is in the category "Business & Industrial\Heavy Equipment, Parts & Attachments\Heavy Equipment Parts & Accessories\Tractor Parts". The seller is "farmerbobsparts" and is located in Southaven, Mississippi.